centers will ever come back. Retrofitting existing ones as health care facilities, by contrast, should be a booming business. Yes indeed. See that little shopping center on the right? It’s about half a mile from my house. It used to have a Radio Shack, a Chevy’s restaurant, a dry cleaners, a chi-chi gift store, an Asian noodle restaurant, and a bunch of other miscellaneous shops. But now? 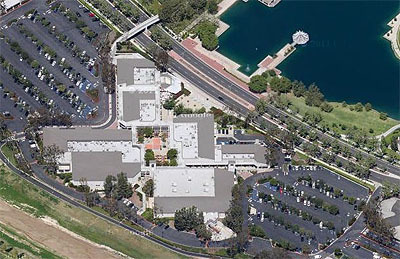 The Irvine Company decided several years ago to turn it into a professional services center, with “professional” defined as doctors and dentists of various kinds. There are still some other kinds of shops there, but I assume that as their leases run out, most of them will be converted into medical space. The good news for CRE, of course, is that buildings are buildings. Construction companies make just as much money building professional offices as they do shopping centers. In fact, maybe someday they’ll start building health malls as big and fabulous as the Mall of America, with plenty of entertainment options to give everyone (and the kids!) something to do while they wait around endlessly for their loved one’s latest round of chemo. Welcome to the future.